When your gearbox is overheating, the first thing to check is the gear oil level. When the gear oil level falls too low to keep the planetary hub properly lubricated, the result is increased friction between contacting parts. This increase in friction leads to a build-up of heat. 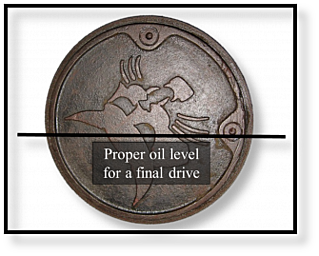 If you find the gear oil level is low, top it off but be aware that there may very well be a leak in your final drive if you have to repeatedly top it off. 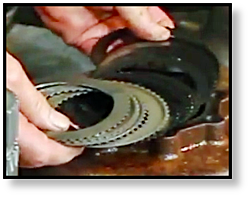 If you find yourself running low on gear oil often, it may be time to replace the seals. If the gear oil level is high enough, then the next item to check is the hydraulic fluid. 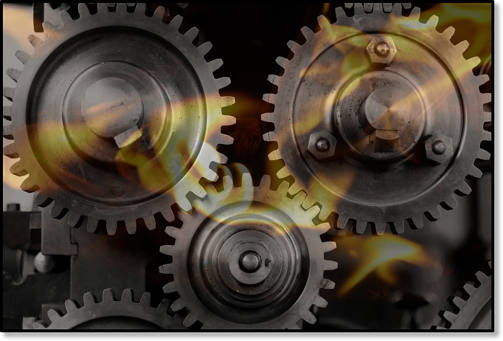 Overheating is actually one of the most common issues that occur in hydraulic systems. A gearbox can begin to overheat if the hydraulic fluid is too hot -- the hydraulic fluid should be no more than 180°F. If the hydraulic fluid is hotter than 180°F, the problem is not with your final drive but an issue with the hydraulics. You will need to check the hydraulic fluid cooler and the hydraulic system. If the gear oil level is all right and the hydraulic fluid temperature is acceptable, then your next step will be to check the brakes. If the brakes aren't releasing properly, then there is going to be a significant increase in damaging friction and heat. You will need to check the operating pressure on the brake and check the piston seals. You can check your machine service manual for information on how to check the brake pressure. Note that a lack of brake pressure is usually the result of a weak charge pump or a brake seal that isn't holding the pressure anymore, and not a problem with the final drive motor itself. If everything else checks out, then the source of overheating is most likely going to be worn-out bearings. If this is the case, the bearings will need to be replaced before a catastrophic (and expensive) failure takes place. Keep in mind that bearings do have a finite service life which can be dramatically reduced if the gear oil isn't properly checked and changed in the final drive. When bearings begin to fail, the results can be very expensive. 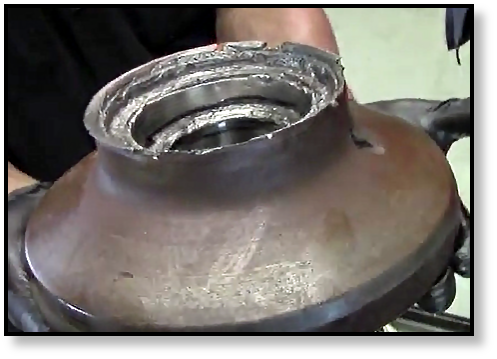 The image below shows what can happen when a bearing goes out and isn't fixed right away -- that type of damage simply cannot be repaired. If your gearbox is overheating, then something is wrong with your final drive. You need to check the gear oil level, hydraulic fluid temperature, and brakes. If the problems doesn't lie in any of these areas, it is most likely the result of bearings that need to be replaced ASAP. As a final note, it's always a good idea to purchase a service manual for your machine for information on proper and routine maintenance.